Seafood burgers with a taste of the East, a little salt, a little hot, slightly sweet and slightly tart. I got hold of fresh uncooked shrimps that was caught just hours before I purchased them. I wanted to make something with them othar than cook them whole in a dish. With teens in the house burgers are always a hit, I think. First I made a traditional fish cake mix and added shrimps and and more fish. dilute with cream until a smooth mince. Add the cornflour, crushed garlic and hopped chives, and continiue blending. In a bowl combine the fish cake mince with the coarsly chopped fish and shrimps. Mix everything together and dvivide this into 8 equal part and make urger pattys. 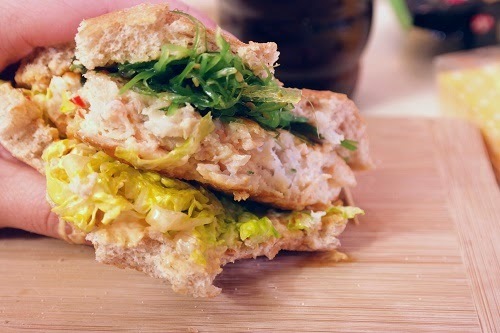 Spread mayonnaise on the bottom part of the burger bread, add shredded lettuce, burger, nori, wakamesalat and finally the top of the burger bread.